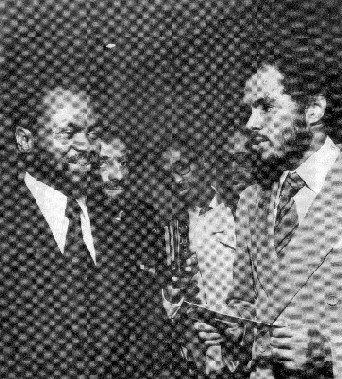 Robert Van Lierop, right, presents a check to President Samora Machel of Mozambique at the United Nations in 1977. The funds, raised from Van Lierop's film showings across the country, went to build a health clinic in rural Niassa province. In the background, from left, are Valeriano Ferrão, James Garret, and an unidentified man. Photo reproduced from Robert Van Lierop, ed. Samora Machel Speaks. Mozambique Speaks. New York: Black Liberation Press, 1977. Bob Van Lierop doesn't know how many copies of his film A Luta Continua were made, or how many times it was shown. And it is probably impossible to track exactly how much influence it had in making the Portuguese-language slogan from the Mozambique Liberation Front (Frelimo) a rallying cry in South Africa and for allied movements around the world. But there is no doubt that for many in North America and Europe it provided the definitive visual imagery that made identification with African liberation struggles come alive in the 1970s. This short film portraying Mozambican guerrillas fighting against Portuguese colonialism was filmed in 1971 and was widely distributed throughout the 1970s. A sequel, O Povo Organizado, was filmed shortly after Mozambique's independence in 1975 and released in 1976. Bob Van Lierop, who produced these two films which deeply impacted black independent cinema in the United States in this period, was not a filmmaker by training. He was a progressive African American lawyer based in New York who launched the project in solidarity with Frelimo, and decided to do the film himself when he was unable to locate a filmmaker willing to take on the task. Robert F. Van Lierop was born in 1939 in New York and grew up there. He graduated from Hofstra University in 1964 and from New York University Law School in 1967. In the 1960s, as noted in the interview below, his political activities included opposition to the Vietnam War and support work in New York for the Student Nonviolent Coordinating Committee (SNCC), one of the networks that put him into contact with Eduardo Mondlane of the Mozambique Liberation Front. Between 1971 and 1978 Van Lierop gave up his law practice to dedicate himself entirely to the Mozambique film project and related activities of the Africa Information Service (AIS), an organization he co-founded in late 1972. Among AIS publications was the widely distributed collection of speeches by Amilcar Cabralcalled Return to the Source. Both that book and the two films on Mozambique were significant influences on black American radical currents and on other Americans involved with supporting African liberation. The release of A Luta Continua in 1972 came just as the armed liberation struggle against Portugal was reaching its height. Mozambique won independence in June 1975 and Angola in November of the same year. In the first half of the 1970s, before the Soweto uprising of 1976 focused solidarity efforts on South Africa, the figure of Cabral and that of Samora Machel of Mozambique featured prominently in the rising identification with Africa among American activists, African Americans in particular. The African Liberation Day coalition, in part the outgrowth of Van Lierop's visit to liberated Mozambique in 1971, brought over 20,000 demonstrators to Washington in May 1972. This pre-Soweto wave of identification with African liberation, which extended to a wide range of black radicals involved in local politics around the country, and to a smaller number of white left activists as well, never consolidated a strong national presence. It was overshadowed, even within the left, both by domestic struggles and by the movement against the Vietnam War. Its dispersed history is virtually unexplored by scholars. Within it, however, there is no doubt that A Luta Continua was a major connecting thread. Van Lierop was also on the board of the American Committee on Africa from the late 1960s until he withdrew to concentrate his organizational commitments on AIS in the 1970s. He has been actively engaged throughout his career not only with African solidarity but also with other progressive causes, both in Harlem and internationally. He returned to the practice of law in 1978 and is the senior partner at Van Lierop Burns & Associates (originally Van Lierop, Burns and Schaap). In 1981 he accepted a request from the South Pacific island of Vanuatu to help with its representation at the United Nations. He then served as its permanent representative from 1981 to 1994, while continuing to maintain his private law practice. While representing Vanuatu, he played an active role in defending the interests of small island states in international environmental negotiations, and was a founder and first chair of the Alliance of Small Island States. As of 2004, there are almost no sources available in print to facilitate further exploration of the Africa solidarity currents of the 1970s that Bob Van Lierop exemplifies. As noted in the interview below, most of the archives of the Africa Research Group (ARG) and the Africa Information Service were lost when a landlord dumped them while Van Lierop was out of the country. Some of Van Lierop's papers, however, are available at the Schomburg Center for Research in Black Culture in New York (see http://www.africanactivist.msu.edu/directory.php for a summary description of these materials). Van Lierop is also planning to deposit additional material still in his possession at Schomburg as well. The interview presented here focuses on Van Lierop's background and first involvement with African issues, including the making of the first film A Luta Continua. Selections from his diary while shooting the film were published in Southern Africa magazine in April 1972. Q: Let's just start then with some very basic stuff. Where and when were you born and grew up, and how did that lead to political involvements and connections with Africa? VAN LIEROP: I was born in Harlem Hospital and grew up in the Bronx, in Brooklyn, and Manhattan. Also, I guess a little bit in Queens too. The only borough that I never lived in was Staten Island. And I guess my first recollections of that were when I was a little boy. Q: What years is that? VAN LIEROP: This would be in the '40s, I guess. My brother taking me out on the fire escape, and telling tales of his adventures in Africa with Jungle Jim and the Phantom. Those were comic book characters. And I didn't know any different, so I believed my brother that he had actually been over in Africa with them. Q: Your brother was considerably older? VAN LIEROP: Yeah, yeah, considerably older. And he always swore me to secrecy and told me not to tell anybody about this, because it was too dangerous for him if I told anybody. And so I never even told my parents about this. Q: What is the comic strip character? VAN LIEROP: Jungle Jim and the Phantom. These were two separate comic strip characters. And I was thrilled that he was telling me about all of his different adventures, which only later on in life did I find out were not true. But he was very imaginative and very creative and he kept my interest. And then, of course, my father had actually been to Africa. My father had traveled the world because he had been a merchant seaman. He had been in the Dutch merchant marines. Q: Your father was Dutch? VAN LIEROP: My father was born in Suriname, and his father was Dutch. And his father had actually been in South Africa and joined the Boer War. My father had been to South Africa, subsequently, as a merchant seaman. Didn't like it. And told me about it, about what was wrong with South Africa, and he talked to me a lot about-not only about Africa, but also about Indonesia and other places where he had been. Q: When did your family get to the States? VAN LIEROP: Well, my mother was born in the Virgin Islands, and my father came here in the '20s after having visited as a seaman. At one time, immigration was a totally different thing in the U.S. then. People from Europe, for example, never had to apply for citizenship, they were automatically citizens. They could come and go as they pleased. And my father eventually did become a citizen. He always told me a lot about other parts of the world, and always talked about colonialism. He hated colonialism, and he had a lot of firsthand experience with colonialism. And he told me about things that he saw in China, for example. He told me about the U.S. Marines riding in rickshaws and the Chinese rickshaw drivers being whipped like horses. He told me how he saw the Marines take off their Sam Browne belts and use the belts like whips, as if they were whipping a horse in a race. And things like that, and lots of indignities on people. He told me about some of the things that he had seen in India and other places. And he always had a strong dislike of colonialism. He was not particularly crazy about the Dutch, but he really, really, really always, even on his deathbed, was talking to me about British colonialism, about how they messed up the world. And when I thought about it, he was so right, because he talked about how different people have been set against each other, wherever the British empire ruled-the Indian subcontinent, in Cyprus, in Ireland, in South Africa. There was an issue of interconnected conflict and ethnic strife that always followed in the wake of British colonialism. Q: Did he continue as a merchant seaman all his life? VAN LIEROP: No. No, no. When he came here, he became-well, first, he started driving trucks and working as a chauffeur for a wealthy person in Montclair, New Jersey. And he was driving trucks. He became a taxicab driver. He was also a presser and a tailor in dry-cleaning shops, and then he eventually got his own dry-cleaning shop in the Bronx. And eventually he sold that and he went to work driving trucks again. And then he got another dry-cleaning shop in Queens. And he made a really successful go with that, up until the time that he retired. I didn't want to take over the business, and he eventually sold it. Interestingly enough, he sold it for less money than he could have got. He had two buyers, one white and one black, and he sold it to the black person for less money because he felt that it was important to keep a business opportunity for black entrepreneurs. He then retired. And on his deathbed, I remember him talking about-I remember how he still rambled about British colonialism. So I guess that was the earliest time that I really remember. Q: And that was basically in the '40s and '50s? VAN LIEROP: Oh, yes. Yeah. And I always had that interest in the rest of the world. And then subsequently, I would say the next big influence-like many people, I thought that the Cuban revolution was an important turning point in the-well, even before that, even before that I think the Algerian revolution. I can remember, as a young boy, following what was happening in Greece, the Greek civil war, and how terrible it was that people were killed because of their political beliefs. And then I think the next big event that I remember-of course, the Korean War, but the Algerian war for independence was something that was very inspiring. Q: And you were in high school by then? VAN LIEROP: Yes. Right. I would say that the Cuban revolution-because Washington, of course, doesn't like to admit this, but pre-Castro Cuba was very much a Jim Crow country. Very much Jim Crow country. And that's not to say that Cuba is a perfect place today, but it is far better than it was and far better than it would have been had there been no Fidel Castro, not only in terms of racism, but also the educational and health and housing opportunities that everyday Cubans have that they never had before. And it's easy for people to criticize Cuba now. If the basis of comparison-if they compare Cuba and the Cuban economy to that of the United States, of course Cuba's going to be suffering in comparison. Or even if they compared the Cuban economy to that of Mexico or Argentina, it's going to suffer in comparison. But the comparison they should be making is the comparison of the Cuban economy with other Caribbean countries. And Cuba has done very, very well in comparison with other Caribbean countries, particularly in light of the embargo and the open hostility that the United States has exhibited. One can only imagine how much progress Cuba could have made had it had normal trade relationships with the United States and others in the region. Q: You were in the military from when? Q: Were you overseas during that period? VAN LIEROP: Yeah, I was overseas. VAN LIEROP: Japan, Korea, Okinawa. And when I came back, I went into college at Hofstra University. Back then it was a college; it became a university before I graduated. And I majored in economics. One of my mentors, my primary mentor, was a professor of economics, Dr. Lynn Turgeon. He was a great, great guy, I owe so much. He was a Soviet specialist. Well, I don't know if he was a-I wouldn't say he was a Soviet specialist. He was a specialist in planned economies and Eastern Europe, and the USSR was the biggest of the countries that he studied. He was a person of incredible intellect and great insight. And he also always told us to have an open mind, to challenge people, but in a very nice, nonprovocative way. I think he really opened my eyes. I probably owe as much to him as I do to anyone in terms of helping to shape my ideas of the world. I miss him. He died a few years ago. I really miss him, because he was the person that I enjoyed talking with so much. And there are some people-Carol Ferry comes to mind also as another person who you could just pick up the telephone and call and discuss what was going on in the world at that moment. And the insight was just so powerful. So those are some of the people that I-those are two of the people, anyway, that I think about all the time and carry with me in my heart. But when I was in college, my interest in international theories grew even more. I think being in the military helped a lot, because while I was overseas, I really immersed myself as much as I could in Japanese culture. I learned a little bit of the language, and I used to enjoy going away from the base and just going to an all-Japanese bar and spending time with people. And I know that nowadays people talk about how closed and insular Japanese people are and Japanese culture and everything, but I never found that. I never experienced that. It was a different time, I guess, when I was there, and I was not based in Tokyo, I was based in Kyushu, the southernmost island. But I found the Japanese to be very, very friendly, very engaging. I had some really, really good friends there. I learned a lot about their culture and the way of thinking, and I enjoyed that time. So much so that I volunteered to stay. I wound up staying. Twice, I extended my tour of duty. And the third time I tried to, I was told that I couldn't unless I reenlisted, and I didn't want to stay in the military, so-but I really loved it. I would say even then I encountered much more racism and hostility on American military bases than I ever did from Japanese people. I used to go to baseball games in Japan, and I only remember one incident where someone called out racial insults to one of the players. But I was never hassled. I would go in an all-Japanese crowd with a Japanese girlfriend, and never had any problems with it. Now, I went back to Japan, I guess in the early '90s, as a diplomat for Vanuatu. That was a totally different experience, because I was not just a regular person there then. I was an official guest of the government. I was treated very, very well. Very well. But it was clearly a different situation. Economically, the country was much wealthier and much more developed than it had been when I was there as an American GI. VAN LIEROP: In the '60s, yeah. Q: -'62, '63, roughly around then? VAN LIEROP: Yeah. And the Teamsters transported these things down south, free of charge, and didn't want anyone to know. At the time, I recall thinking that that was really generous and magnanimous not to want anyone to know what they were doing. But now, maybe in retrospect, looking back, maybe they thought that it was best for them that the other side didn't know they were doing that. So I remember having mixed feelings when Bobby Kennedy made it clear that he was going after the Teamsters. And I felt even then, and even more so now, that no one, no human being, is 100 percent bad or 100 percent good. There's lots of good and lots of bad in all of us. So I guess I'm skipping around because I haven't really organized my thoughts that much. But anyway, about that time, we were also beginning to think about the war in Vietnam. Q: Were you in touch with Bob Browne at that time? VAN LIEROP: I met Bob later, after law school. I was working with the NAACP. And I read an article that Bob had written in Ramparts magazine. And I was so impressed with the article. It was an article about separation and possibly reparations, but more on separation. I was very impressed with the article, and I just took a stab and called Bob. I was able to find his number, and I called him. And Bob Browne-he was very responsive. I was surprised that I was able to reach him like that and that he responded so quick. And he said he'd come into Manhattan and meet me. And he came to my office at the NAACP, and that was the beginning of our friendship. VAN LIEROP: That was in 1968. That was the beginning of our friendship. I was very, very impressed with him. Totally unassuming and modest and I felt he was so bright, which he is. By coincidence, the NAACP had a seat on the board of the American Committee on Africa. Bob was on the board, and so I got interested. And Mildred Roxborough, a person who I think so much of, who was then the chief administrator of the NAACP, arranged for me to represent the NAACP on the ACOA board. And that was how I actually got involved in the ACOA. I had actually gone to Africa for the first time in 1967, and that was where I met Eduardo Mondlane. Q: OK, what was the '67 trip? Who arranged that? Q: You were at law school where? Q: That would have been what year? VAN LIEROP: The year was '64. But I met somebody who was involved with people in Angola. And I was offered a chance to go to work for a doctor who was running medicines to the guerrillas. VAN LIEROP: In Angola. Well, actually, in northern Angola. Q: Right, but he would have been based in Congo. VAN LIEROP: Based in Congo, yeah. And the only reason I didn't go was because my girlfriend-my then girlfriend talked me out of it, and I said, I'm just going to go to law school. And maybe it's better that I didn't, because I'm not sure that this was the right group that I later on would wind up supporting. I'm not so sure that it was the MPLA. Q: OK, so it would have been with FNLA at that time? VAN LIEROP: It might have been. I didn't know. Q: Oh, right, because it depends on the exact time. VAN LIEROP: Yeah. There were two-there was a South African couple that-Eve and Tony Hall. I'm sure you know them. Q: I know the names, yeah. VAN LIEROP: Yeah, they were living in exile at the time in Nairobi. They were ANC activists, white. And I was invited to dinner at their house one night, and met Eduardo there, and was completely captivated by Eduardo. And he told me that when I got to Dar I should give him a call. I told him also that quite by coincidence, that Danny Schechter had told me about him also. Then two days later, I did reach Dar, the following week. I had arrived without-my suitcase was lost. And I always remember I was wearing these very loud blue with white pinstripe bell-bottom pants, that were in the day. And I called Eduardo to say-well, I called the Frelimo office to say that I had arrived and I'd like to speak with him, and I told him that my suitcase was lost and things like that. He and Janet drove up in front of the hotel. I can't remember the name of the hotel, it was a small hotel I stayed in in Dar. And they drove up to the hotel, and Eduardo saw my pants and laughed. And then he said, here, I brought some clothes for you, they're probably not your size, but-[laughter]. And they arranged for me to stay-as a matter of fact, I eventually stayed with Polly Gaster and- oh, God, I don't remember. Q: I forget, but I-yeah. VAN LIEROP: Yeah, so I stayed on at the [Mozambique] Institute with them. They had a flat near the Institute, and spent a lot of time at the Institute. Q: Did we meet then? VAN LIEROP: No, actually we met later on. I think we met back here. But I stayed for a few weeks, and eventually I did get my suitcase. If you wait long enough, it turns up. VAN LIEROP: And I left then to go to Kinshasa, and my suitcase was full of Frelimo literature and ANC literature, and some from SWAPO also, and it was not the best thing to do in then Zaire. President Mobutu was always not a very good guy. And the OAU [Organization of African Unity] summit was taking place there in Kinshasa. I was very idealistic in those days, and so I thought that with all this literature, I would help to distribute it to people there. And I did pass out quite a bit of it in Kinshasa. I'm lucky, I suppose, that I didn't get arrested. And my appendix ruptured. This is an interesting story. This is really incredible. I was actually on my way to Brazzaville, and-well, first, this is, the more I think about it, this is really an incredible story. I digress a little bit. Do you know Christopher Wambu? Chris Wambu. Q: I don't think so. VAN LIEROP: He's here now. He teaches school. When I was in Kinshasa in the airport into town, I met-he was a young Kenyan who had got on the bus, and we struck up a conversation. And it turned out that he had been working in Nairobi in a store, and had been fired for complaining about discrimination. And hitchhiked from Nairobi all the way up to Kisangani. And he had been beaten and robbed by the Congolese army one day, and the next day he was beaten by mercenaries that were chasing the army. And an American diplomat had taken pity on him and put him on a plane going down to Kinshasa, and that's when I met him. He had no money, nothing. And so I told him to come with me. And I tried to find hotels and couldn't. Everything was booked because of the OAU summit meeting. And the last hotel that I checked, they asked me what nationality I was, and I said American. And they said, okay, well American citizens are supposed to contact the U.S. Embassy. And so I did call the embassy, and it was at night, and there was a Marine on duty. And I told him that I had finished law school, and I told them that I was a New York lawyer there on business with a colleague. And they said, oh, okay, sir, and so forth and so on and sent a car and somebody over to the hotel. They told me to just stay there, and so they put me up for the night in the embassy in these apartments, embassy flats. So I told Wambu to come with me, told them he was my colleague. I didn't exactly say he was my business partner, but I left the suggestion there so that-and so we stayed on in the apartment that night. VAN LIEROP: -going to do for me what Powell had done for him. And he said he had a friend who had gone to Brussels on holiday and had a house, and I could stay at the house. And I said, well, I've got a friend with me also. And he said that's okay. The two of you can stay there. And so Wambu and I went and stayed at this house. And I was going on to Brazzaville. Wambu had become a close, close friend, like a brother, and I didn't know what I was going to do. I was just graduating from law school. I didn't have any money, I was traveling on a shoestring. I didn't know what I was going to do to try to help him. He stayed in the car. And I had a run-in with a pickpocket, and I felt this pain in my rib there, and I thought that maybe the guy had punched me or something like that. I really didn't think that much of it. And went back to the house that night and couldn't sleep, the pain was so bad. And so the next day, we hitchhiked-Wambu and I hitchhiked. He was taking me to the embassy, to the doctors. And no cars would stop. And Wambu then flagged down a car. And I never saw him like this. It was totally out of character for him. He told them that if they didn't take him to the embassy, he was going to kill them. Of course, he wasn't going to do that, but he told them that. And then he took me to the embassy and to the doctor. And there was nobody in the doctor's office. And so I just waited around. And Wambu left me there, because he knew that he wouldn't be welcome in the embassy. And eventually, the doctor came in and looked at me, and he said what the hell are you doing here? And I said-I made a joke out of it. I said don't shoot, doc, I'm an American. And he said I don't give a damn who you are or what you are. What are you doing here? I said I'm sick, I don't know what's wrong. And the doctor said what agency are you with? Not with any agency. He said, well I'm not required to treat you. And I said, well look, what can I do? And he said there's an American doctor at the OAU village. Maybe he'll see you. VAN LIEROP: William T. Close, yes. And this doctor turned out to be Mobutu's personal physician. Q: And the father of Glenn Close. VAN LIEROP: I didn't know-at the time, I never heard-nobody had ever heard of Glenn Close. Yeah, yeah. And Dr. Close, he said where's your car? And I said I don't have a car. He said how'd you get here? I said I hitchhiked. What, are you crazy? And he literally picked me up and carried me, put me in his car, rushed me to the hospital and operated right-he told me that my appendix had ruptured, and he said that I was in mortal danger from the rupture. And he operated on me, and he kept me in the hospital and everything like that. He took real good care of me. I had no money. None. And it was a Congolese hospital, which even then was not the best. But I had a good doctor. He saved my life. They weren't expecting me to pull through. They contacted my father and told him that they didn't expect me to pull through. But I did make it. Stayed in the hospital for a while. Wambu came to see me. And Charlie, who was the Belgian guy, Charlie Hénault. And his friend, the judge, Jean-Louis LaHaye, who years later-I just found him last year. I had not seen or heard from him since then. But there was a couple, a diplomat at the U.S. Embassy. He was very nice. John Vincent and his wife, Sheila. They were very, very interesting people, and they came to see me at the hospital, and did what they could. They also agreed to take care of Wambu once I left, to make sure that he survived. I checked myself out of the hospital earlier than I was supposed to, and flew to Accra, where I had friends of the family who had gone to school with Kwame Nkrumah. VAN LIEROP: At Lincoln. Lincoln University. And when Ghana became independent, they had left their dental practice in Brooklyn and gone to live in Ghana. VAN LIEROP: Yeah. Bobby and Sarah Lee. Bobby would even also introduce Malcolm when Malcolm made his speech in Accra. They were old friends of the family. They had become Ghanaian citizens, and their two sons had grown up there. So I went and found them. Nkrumah had just been overthrown. Again, I didn't know how to find them, but I had some incredible luck, because at the airport in Accra. I saw a Ghanaian colonel, and when I asked him if he knew Bobby Lee, he said yes, of course I know him. Good friend, blah, blah, blah. He took me to his house. After he left, Bobby told me that he was very suspicious when this guy had called and said he had a friend, because he said this guy was one of those who had overthrown Nkrumah and was not his friend at all. So he was very suspicious when he called and said he had a friend at the airport he was bringing over. He was so surprised to see me. I stayed and recuperated a little bit there. And then from there, went to Dakar to prepare for my journey back home. I met a couple of good guys from Sudan in Dakar, and a good guy Jon Brion, working in the Peace Corps. And I was in touch with Chris Wambu through the Vincents. And the Vincents got this crazy idea of sending Wambu to the States to do his schooling. At first I thought it was a crazy idea, because I said, who's got money for that. Somehow or another, they were able to work it out, and they got Chris Wambu a scholarship. He did wind up coming here to go to school, and he wound up living in Chicago. I think Gail knows him. I know that Mimi knows him. Mimi knows him, Prexy knows him. Yeah, he was in the circle. When he got to Chicago, I put him in touch with all the people that I knew there, and I would go out to Chicago to see him. VAN LIEROP: He teaches school here in New York now. He got involved in liberation support work in Chicago. And so all of this turned full circle. Years later, decades later, I was reading the New York Times op-ed [page], and I came across an article written by a Dr. William T. Close, and it described him as the father of Glenn Close. And I said, I'll be a son of a gun. And later on, I was able to find his telephone number. He's retired and is living out in Montana. I called him up and thanked him. And it's just-I've been incredibly lucky. Incredibly lucky in everything, I have to say, from meeting Charlie Heighnaut to being saved by Dr. Close, to not being arrested by a colonel in Ghana, but being taken to Bobby Lee's house. Q: Then after that, you got on the ACOA board. VAN LIEROP: Yeah, right, in '68. Q: And you were on the ACOA board for quite some time. VAN LIEROP: Yeah, but not that long, because eventually when Africa Research Group decided to disband, and they wanted to turn it over to a black organization-and this was probably my biggest mistake, because I'm not an administrator. Never wanted to be and never should have been. Q: And that was '69, wasn't it? Or '70? VAN LIEROP: Yeah, I think it was-no, it was after '71. I think it was '73 or somewhere around there. And I spoke with Bob Browne because at the time he had that building on 120th Street, where the Black Economic Research Center was. And he was willing to house the collection, but he didn't want to take on responsibility for keeping track of it and keeping up with it. And so I agreed to do it, and with some people, we formed something called-well, we branched out from the Mozambique Film Project and we called it Africa Information Service. And that was my trap, because having to take care of all those things just became a huge, huge task. And I could see why the ARG disbanded, because there was a huge undertaking to take care of all of those things, and we were not able to do half as good a job as they were in terms of issuing publications and research papers and things of that sort. But at least the collection was in the black community, it was in Harlem. Heywood Burns led a group of us from the National Conference of Black Lawyers. And so in that brownstone, we had Bob Browne from the Black Economic Research Center, Heywood Burns, the National Conference of Black Lawyers, and myself and others with the Africa Information Service. Then eventually, we distributed A Luta Continua. And we were able to get loft space, so we had a lot of space down on 27th Street. We moved the whole collection down there, and stayed there until '75. And then I went back to Mozambique to do another film at that point. Tapson Mawere was the ZANU Patriotic Fund representative, and they needed office space. So I told them to just take that space and take care of the collection. But unfortunately, the rent wasn't paid. I came back in, I guess, late '75, and drove by just in time to see a dumpster container full of all of the books and records that was going to be hauled away, because the landlord had gone and repossessed the place and taken everything out. Q: And there was nobody else in charge except Tapson? VAN LIEROP: Tapson was there, Tapson was there. And I remember. I was in a car somewhere, and we followed the container to the Hudson River, where it was being dumped. I actually-Bill, this is crazy. I actually jumped into the thing and pulled out and saved whatever I could. We managed to save some things. There were some incredible manuscripts that I had gotten from a guy who had worked with Felix Moumié in the Cameroon. Manuscripts-original manuscripts they had written about their experiences there. So we saved some things. VAN LIEROP: Yeah, I deposited a lot of things in the Schomburg, and I'm going to give the Schomburg even more, including the film stuff that I have. There were some floods that damaged a large number of files that took place in this office. And there was a flood in the basement that damaged a lot of stuff. Q: But you still have good copies of the films themselves? VAN LIEROP: I'm definitely amenable to that. Q: I know a project I'll talk to you about later, that's trying to digitize some resources related to Mozambique. But somehow or another, whoever does it, that's important history. VAN LIEROP: Yeah, we should. We should. But anyway, I stayed on the ACOA board until the time that AIS came into existence. And I left the ACOA board then just because I didn't think that it was right to be on both boards. I felt that I should give all of my time to AIS, and we could work with ACOA and work with others. I shouldn't serve on both. Q: I'm familiar with both films, and there are certain things written, but what I'm interested in is how did the idea come up to do it, and some of your evaluation of the impact of those films. Because I think they, particularly the first one, came at a very decisive time period. A lot of people used it, saw it, heard you and other people speaking using it, and in a sense, it fed in to the African Liberation Support Committee (ALSC) growth. So I'd be interested, both how it came about and also, if we have time to get to that, your evaluation of the ALSC phenomenon and its growth, and the fact that it stopped. Q: Do you remember what year it was he arrived? VAN LIEROP: I think Shafrudin came in '68. I think so. And I was one of the people that Eduardo told him about to contact. And I was at some function somewhere-I don't remember where it was, and Khan and I met then. I was handing out brochures about Frelimo and Shafrudin was amazed. We met and we became fast friends. And he said he had just arrived and that Eduardo had told him to find me, that I was one of the people he should contact. And then Eduardo came. The three of us would sometimes talk about what can be done to increase people's knowledge and awareness of Frelimo. And the idea of a complete media treatment came up-articles, photos, even a film documenting the struggle. I was not a film director, and had no previous experience or knowledge about film. And my initial assignment was to find somebody to do it. And I asked quite a few people I knew who were filmmakers. None of them seemed to have time to take it on. They felt that it was difficult to get into the liberation areas to do this, based on how you could possibly do that. And while we we're looking for that, I had another incredible experience. One of the partners in the law firm that I worked for was on the TWA flight that was hijacked in September of 1970. In June of 1970, the Jordanian Army and Palestinians had confronted each other in Amman and the refugee camps, and the Jordanian desire to reign in the Palestinian movement. And on September of 1970, if you remember Leila Khalid. And there were four planes that were hijacked simultaneously. And they took all the passengers off and blew up one of the planes in the desert. And that certainly-compared to today, that was certainly a nonviolent and a benevolent action. And they released all the hostages except, I think, 35 or 36, who-I may be wrong, but I believe all of them were Jewish. And the partner at the law firm knew that I was a supporter of the Palestinians, and he asked me-he wasn't even thinking about asking for release, he just wanted-and they had not threatened to kill anyone. It was a different era. VAN LIEROP: No. No, no. His daughter. His 16-year-old daughter had stayed the summer on a kibbutz in Israel. She was hijacked, and so he came to me to ask about getting a message to her. And I said I don't know how to go about doing that. And he said that he had a way of getting a telephone line through-well, the company doesn't exist anymore, so I guess it's not [a problem] to say this, but Aramco could somehow patch a telephone line through. Would I be willing to get on the line and talk to my contacts there and try to ask them if they could deliver a message from him and his wife to their daughter? And the caveat was that Aramco could not let it be known that they had anything to do with this. My good friend was then very much in contact with someone close. His name was Paul Boutelle. Along with Paul, who was a member of the Socialist Workers Party at the time, we had taken out an ad in the New York Times, called " Black Americans for Truth About the Middle East." " A Committee of Black Americans for Truth About the Middle East," COBATME. Quite an acronym. So this was all arranged, and I got on the telephone with Bassam Abu Sharif, who was then the principal spokesperson for George Habash, the leader of the Popular Front for the Liberation of Palestine (PFLP). Bassam later married Leila Khalid, and he later became special advisor, the number two person to Yasir Arafat. At the time he was the public spokesperson for George Habash. I told Marty that I wouldn't ask for any special favors for her, that I would just ask as a humanitarian gesture about this message getting through to her, back-channel stuff. He said, fine. The law firm that I worked for, they were very good guys, because they knew my interests and never gave me a hard time about it. Q: What firm was this? VAN LIEROP: Fleischer, Dornbusch, Mensch & Mandelstam. Ironically, it was an all- Jewish firm. It's funny, the Palestinian resistance then was very different from what it is now, and the circumstances of the situation were very different. Anyway, Bassam got on the telephone with me, and I told him of the parents' request to deliver the message. He said, you know what, I'll do even better than that. He said how would you feel if we are willing to release this girl to you and her father, as a gesture of solidarity with Angela Davis and black people in the United States, and if we challenge the United States to drop its charges against Angela Davis? This would not be a precondition, but we would just challenge the United States to do so. And her father was so happy. And Bassam said, okay, you bring him here and we'll do that. When Washington learned of this, I have to tell you that they tried to damage the talking that was going on. They said it was a trick, that it was a plot, that I was in on it, and that I was going to turn him over to the PFLP, and that he was an important lawyer and they were really interested in getting their hands on him also. And they never stopped telling me that. Martin Mensch showed a lot of guts because he got on the phone and he said we're going. While we were in the air-and this is one of the funniest things- I said to him, Marty, you are really a courageous guy. I said it's one thing for me to go over there, but for you to go over there, after all this stuff that you're being told, I said you're really very courageous. He said, Bob, you don't understand. He said I'd rather face those guys than face-how did he say it, I can't remember exactly, but basically he was saying, my wife is a Jewish mother, and I'd rather face those guys than face her and tell her that I'm not going to get our daughter. He said something else that was really funny. He said, I'll tell you something that's very odd about the world, this should be a lesson to you. He says I know you're doing this for all the right reasons. He said I'm going to get my daughter, that was his goal, but he added that when we come back, you watch and see, because we went through this, this is going to be great for my business, because people are going to think that I am so well connected and can get results in difficult circumstances. Every place we stopped, the plane was met by U.S.-now I guess they were probably CIA, but I didn't know what they were at the time. And they were trying to talk him out and saying don't go, don't go. To make a long story short, we were taken off-well, I was taken off the plane in Athens and searched as a possible terrorist. I had a lot more hair then, and it was kind of curly, and they-well, we missed our connecting flight because of that. And so what we did, Marty chartered a plane and we flew to Cyprus, and then-no, no, no, I'm sorry. We got another flight to Cyprus, and then from Cyprus, we chartered a plane and we flew to Beirut. And this small plane flew us from Cyprus to Beirut, landed on the edge of the runway, and we just jumped out of the plane and walked in from the runway, from the tarmac to the terminal and then through immigration. And there we were. I made contact with Bassam. From Beirut we went to Amman on a flight, and then in Amman-well, in Beirut, I made contact with [inaudible], and then in Amman, we made contact with Bassam. And Bassam met with us and he told me the situation had changed, that they had intelligence that the Jordanian army was going to attack them and they had moved all of the hostages to another location for safety. They were going to take care of them and make sure they were all right, that they would not be harmed. And I went back and told Marty, and Marty was cursing all of them. He was crushed. And he was also pissed off. He said they broke their word, they didn't-they're not keeping their word and so forth and so on. And he and I had a philosophical discussion saying that they have to do this, they can't betray the revolution or [do] what they might wish, and so forth and so on. And Marty was resigned to the fact that we weren't going to get her. And then before we knew it, the hotel we were in was surrounded, because during the June battle the Palestinians had taken the hotel, rigged it with dynamite, and threatened to blow it up unless the Jordanian Army stops shelling the refugee camps. Until this time, the Jordanian army occupied the hotel. Right away before they attacked, they put recoilless rifles; they were shelling the camp from the hotel, so of course the Palestinians were shooting back at the hotel. And we were trapped in the hotel with 100 people, most of them Western journalists, but a few other people as well. And it was a harrowing experience. While we were going through that, Marty said to me that if there's something that you want to do in life, you should do it and not hesitate. And it was at that moment that I decided to go back and make the film. VAN LIEROP: And eventually, after a few weeks, we got out. They did release all of the hostages and Barbara. As a matter of fact, some guards were killed protecting them. And there was one, Barbara said, who-one of the hostages who had to have kosher food, and every day they went and got kosher food for him. Nowadays, no one would ever believe that about the Palestinian resistance. And so when Barbara came back, she went back to her high school and started talking about justice for Palestinians, and some people accused her of being a traitor. The New York Post wrote a story that she was my girlfriend. I had never met her before. She was only 16 years old, but that was the New York Post, even then. So Marty, on the way back to New York, Marty told me to stay in Europe, if I wanted, for a few days and just not worry about my job. It would be there when I got back. When I got back to New York, I told him that I was going to resign from the firm and I was going to go with finding funding for this movie. And I had done work for the firm raising money, and used that approach to raise money for the film. I actually met Carol Ferry because she was a client of the firm, and Peter Weiss  also, who did a lot of work with partners of the firm. I did a lot of work with Peter, who was involved in the trademarks work for that firm. And so Carol put in money in the project, Peter and Cora did, and a few other people, but those were the two biggest sources of funds. Q: And that was a separate project? VAN LIEROP: That was a separate project, that we were off the radar screen and awaiting word from Frelimo. And then I did receive word from Jorge Rebelo, after a few months in Yemen, that we should proceed down to Dar es Salaam. And while we were in Dar es Salaam, Adjali had to return back, he had to go back. He wasn't well. And so it was just Bob Fletcher and myself. And it was then that Chissano said to them that they had settled for the three of us, but since Adjali got ill and had to go back to New York, would we mind if a third person came along. VAN LIEROP: Howard Fuller. And I said, well, how could we object? We're your guests. And he said, well, you know that sometimes you Americans can have your own tribal conflicts. Q: Did you know Howard at that point? VAN LIEROP: No, I didn't know him. I knew people who knew him. VAN LIEROP: University, yeah. He did go with us. When he came back, he did some good things-the African Liberation Support Committee, I have to say. He also did some rather bizarre things, because he was one of those who flirted considerably with UNITA and began to talk about UNITA being better than MPLA. He was very nationalistic, initially. He went from being a nationalist to being a Marxist, to now being a Republican in the Bush administration. A George Bush Republican. So he went from being Howard Fuller to Owusu Sadaukai, but now he's back to being Howard Fuller. Q: But once you got back and made the film-obviously it took some time to put it together and get it out. What were the networks you used to get it out? Was ALSC one of them? Q: Who in the Methodist church? VAN LIEROP: Do you remember George Daniels? And David Bridell? Q: George Daniels, I know. And then Episcopal? VAN LIEROP: That was a little bit later, and that was through Howard Quander. I actually met Viola Plummer, who was working for the Episcopal Church, before. She didn't know where we were going or what we were doing, but I met her in Dar es Salaam. She was there at the same time with some delegation with Howard Fuller. A lot of the African support committees-the Southern African Committee and former ARG people, the friendsin Chicago, all of those people helped get the film out, as well as colleges and universities. And I knew a lot of people in Europe also, and met even more-the Angola Comité, Bosgra. And I met some of the Scandinavian groups. Do you remember, there was a big conference in Frankfurt, Germany, I think in 1972? It was church-related. Prexy was there, and I was there, and there were a few other people there. And that was one way that the European network was tightened up. And from time to time, there would be conferences in Europe, and we would get [the film] out there and- Probably, most people would have said that I was too loose with it, because I didn't keep much control over distribution. I just basically let people who were willing to go out with it, use it. And I asked that the money that was raised be sent to Frelimo. We did raise some money for a medical clinic, I think, but I didn't keep nearly enough control. And I began to see what was wrong with that when I was raising money for the second film, because we literally had to go begging again, hat in hand, for money for the second film. Q: Rather than having built up capital? VAN LIEROP: Yeah. And I was never able to do a third film because I had never asked people. And this, I think, is one of the things where the movement fell down, because we should have had money to do the third film, but it never did happen. I left law and was working as a waiter down at Village Vanguard at night, so that I'd be free in the daytime to do this work without a salary. Everything that we brought in from the film went back to the project. And I just lived on the tips that I made as a waiter. And some people found that-people who knew that I had been a lawyer already said you did this when you were in law school, what are you doing? You're a lawyer now, why are you waiting on tables? And it just seemed like the right thing to do. I wanted to do this, and this was the only way that I could support myself without taking money from the project. And then subsequently, in '77, '78, I did go back to practicing law, hoping to [finance more] films. After that is when Vanuatu asked me about representing them at the United Nations. And when they first approached me, I said no. And I told them that I was going to be going off back to Mozambique to make another film. Q: And how did you make that connection? VAN LIEROP: They actually knew of me through some people at the UN and through the Sixth Pan-African Congress. And they wanted an African American to handle it, somebody with legal experience and who had been involved in international relations. VAN LIEROP: I was supposed to be there, but I didn't go at the last minute. And they were there, and I began doing some things for them before their independence, just helping them out a little bit when they came with their petition at the United Nations. And I didn't think that I did anything significant. I don't think I did much at all, but they couldn't send someone, and so they asked me to do this temporarily. At first I said no. And they also had a connection with me through East Timor. And of course, East Timor had a connection with me through Mozambique. Q: So you knew José [Ramos Horta]? VAN LIEROP: Yeah, I knew José very well. VAN LIEROP: From Mozambique and from here. He was the representative here. As a matter of fact, José was at the premiere of O Povo Organizado. And so all of this goes back again to Mozambique. Mozambique was the thread of my connection with East Timor, which was also an important thread in my connection with Vanuatu, which was an important thread for my connection with all of the Pacific. Vanuatu, East Timor, and Mozambique, that thread all runs through there. And I even took the films to the South Pacific and showed it over there. It was shown in very, very remote areas of Vanuatu. Q: So for the period '71 to '77, you were really spending almost all of your time on your films, distributing them. You were going out and speaking with the film a lot, right? Q: And basically just being able to support that by what people paid for it, plus your Village Vanguard. Q: Do you have any idea what year that is? VAN LIEROP: '73, '74. I think it was '73. Q: Yeah. Guebuza visited the States in '73, because he was in Madison with us. VAN LIEROP: Yeah, that's right. VAN LIEROP: Yes. That's right. And of course, they used it-it was smuggled into Portugal by Frelimo. They used it there. It was also smuggled into South Africa. And prior to the Soweto uprising it was shown by the Black Consciousness Movement and others in South Africa. And they began to use some of the slogans-a luta continua, they began to use a lot of them, which was, of course, as you know, the way Eduardo always signed his letters. That was why we chose that title. And actually, the film technically, we were not able to do what we had planned on doing because some of our equipment was lost crossing the river. So we didn't have a sync camera, so we had to use a 16- millimeter spring-wound Bolex camera, and that means, number one, very short takes, and number two, that the sound could not be synced to the picture. So we had to do that in the editing process. Richard Skinner was the editor of the first film, and Richard had experience making television commercials, and so he was very good at editing with quick cuts. And Richard I had met through Howard Quander, who was at the Episcopal Church. The second film was edited by Paul Evans, who I became really, really close to. He died in the '70s of lung cancer. And Paul apprenticed as an editor on Midnight Cowboy. He had an uncanny ability to work with music and sound in the editing process, and that's why you'll notice in that film, the second film, O Povo Organizado, that the music plays such a crucial part in moving the film forward and telling the story. The music plays a role in cutting from scene to scene. That was one of Paul Evans' real strengths as an editor. Q: Let me just finish up, because I know you have work, by asking really less for more details than a background question. Have you or anyone else associated with the film thought of writing up some of your own memories, experiences of it? And even I'm thinking, okay, the AIS material, material you have from Africa, but I'm thinking what an enormous resource it would be if somebody had even a clue as to how many copies were made and how often it was shown over those years, because a lot of people saw it. And even if they didn't follow up with involvement in Mozambique, it had an effect on mentalities beyond that. At least that's my hypothesis. I don't know. What's your take on that, just from feedback you've had? VAN LIEROP: Well, actually, it's very gratifying, because I think that everyone would like to feel in life that he or she has contributed to something meaningful. And I definitely do feel good, because I think that we did contribute to something that was both good and important. I never was able to keep records of how many copies were made and where it was shown and all of that. At one point, I did prepare and give to Chissano a list of all the premieres that had been organized, how many people attended, how much money was raised and everything we gave Samora [Machel}. I think you were there at the UN. Were you? VAN LIEROP: We gave Samora that check. Q: Do you know what year that would have been? VAN LIEROP: '77, I think. And Ferrao was there. This was before Ferrao went to Washington as ambassador. Q: Lobo was already ambassador at the UN? VAN LIEROP: Yeah, Lobo was ambassador. And I do have diaries that I kept all during those years, and I actually thought of doing two books. One was going to be the guerilla diaries, and the other was going to be a photo book. But I never got around to it. Administering AIS took so much time, that I never got around to doing-so I'm thinking about doing it now. I'm going to be moving. I have to move, I'm going to relocate. VAN LIEROP: Office and home. And so what I want to do is I'm going to try to carve out some time to write. I sort of thought that it was not marketable since people are no longer interested in southern Africa and that the book would not sell. And excerpts from the diaries were published in Southern Africa magazine. And I heard from Basil Davidson-I have a lot of respect for Basil. And so I would like to do that somehow. I don't know whether it should be a novel or if it should be nonfiction. But I think nonfiction. I don't know whether there is much of a market. VAN LIEROP: I would like to do that. Q: Whatever you get down, I would say this is the sort of thing that at some point-I don't know how personal the diaries are, but they should be in the Schomburg. VAN LIEROP: Yeah, they will be there. Q: They should be in some place. And, of course, whatever you've been able to process with reflections, then both the originals-because that was then, right-and your reflections on them are things that are important for history. VAN LIEROP: Yeah, I will do that. I will do that. I remember Janet [Mondlane] read them. I gave them to Janet to read and tell me what she thought. And I remember two things. One, she said that I was still too idealistic. And she thought that they would make an interesting read, but maybe it's better if there's been a passage of time, because maybe now I'm a little bit-not much, but maybe a little bit less idealistic, so there are things that-I am interested in doing that. Bonifácio Gruveta was also with that column. Oh, I loved him. I don't know where he is now, or what he's doing now. Q: At one point he was governor in Zambézia. VAN LIEROP: Yeah, I remember then. I remember that, but I don't know what's happened to him since then. But he is a good guy. He and Guebuza were very, very close. I don't know what's happened since then. Q: I'll let you get to your other work. Africa Information Service, ed., Return to the Source: Selected Speeches by Amilcar Cabral (New York: Africa Information Service, 1973). Cabral (1924-1973) was the leader of the Africa Party for the Independence of Guinea Bissau and Cape Verde, and one of the most influential African political thinkers of the period. He was assassinated by Portuguese agents in 1973. Carol Bernstein Ferry (1924-2001) was one of the leading philanthropists supporting progressive causes over many years, along with her first husband, Daniel Bernstein, who died in 1970, and her second husband, W. H. Ferry, who died in 1995. She and her first husband were friends of Eduardo Mondlane, the first president of the Mozambican Liberation Front (Frelimo), and she was a consistent supporter of the American Committee on Africa and other groups. The Congress of Racial Equality (CORE) was one of the major U.S. civil rights organizations. Of the voluminous material available, see particularly James Farmer, Lay Bare the Heart: An Autobiography of the Civil Rights Movement (New York: New American Library, 1985) and August Meier and Elliott Rudwick, CORE: A Study in the Civil Rights Movement, 1942-1968 (New York: Oxford University Press, 1973). Julian Bond, communications director of SNCC, has had a distinguished career as a state legislator in Georgia and a national civil rights activist. Since 1998 he has been the national chairman of the NAACP. Since 1987 Danny Schechter has been the director of the media company Globalvision. From 1988 to 1991 he directed the public television weekly news magazine South Africa Now. See Danny Schechter, News Dissector: Passions, Pieces, and Polemics; 1960-2000 (New York: Akashic Books, 2001). Robert S. Browne (1924-2004) founded the Black Economic Research Center in Harlem in 1969 and directed it until 1980. He was among the early core of activists in the American Committee on Africa and a leading opponent of the Vietnam War. His career as an economist, policy analyst, and activist focused on economic development in black America and in Africa. The American Committee on Africa was founded in 1953 and based in New York City. The early years of the ACOA are discussed in George Houser, No One Can Stop the Rain: Glimpses of Africa's Liberation Struggle (New York: Pilgrim Press, 1989). Houser led the organization from its founding until 1981. For additional information see the interview with Houser in this archive and additional material referenced in the African Activists Archive at http://www.africanactivist.msu.edu. Eduardo Mondlane was the first president of Frelimo. He held the position from 1962 until his death in Dar es Salaam in 1969 from a letter bomb sent by the Portuguese secret police. The Popular Movement for the Liberation of Angola (MPLA) was headed by Agostinho Neto. The Front for the National Liberation of Angola (FNLA) was headed by Holden Roberto. The African National Congress (ANC), the South African liberation movement. Polly Gaster, one of the leaders of a British support organization called the Committee for Freedom in Angola, Mozambique, and Guinea-Bissau, moved to Mozambique after independence. She founded and directed the Bureau for Public Information in the Ministry of Information. Margaret Dickinson edited a book of poems from Angola, Mozambique, and Guinea-Bissau under the title When Bullets Begin to Flower (Nairobi: East African Publishing House, 1972). The Mozambique Institute in Dar es Salaam, founded in 1963, was a channel for support to the educational and social programs of Frelimo. Its buildings also housed the Frelimo secondary school until 1968 and the Frelimo Department of Information. American physician Dr. William T. Close moved to the Congo in 1960 as a medical missionary and lived there until 1976. Among other connections, he became personal physician to Mobutu Sese Seko. He is the father of film actress Glenn Close. Dr. Robert Lee, a dentist who had been a classmate of Kwame Nkrumah at Lincoln University, moved to Ghana in 1955. There is an interview with Dr. Lee in Ernest Dunbar, ed., The Black Expatriates: A Study of American Negroes in Exile (New York: E. P. Dutton, 1968). Gail Hovey is one of the co-editors of the No Easy Victories project. Mimi Edmunds is one of the interviewers and writers. An interview with Prexy Nesbitt, a leading activist based in Chicago, is included in this archive. The Africa Research Group, founded in Boston in 1968, was one of the key groups involved in radical research and popular education on African liberation in the late 1960s and 1970s. Its publications include the book Race to Power: Struggle for Southern Africa, published as a pamphlet by the organization in 1971 and as a book in 1974 (New York: Anchor Press). Among the members of this group were Danny Schechter, mentioned above, and South African exile Margaret Marshall, who later became chief justice of the Massachusetts Supreme Court. On Africa Research Group, see Danny Schechter, News Dissector (New York: Akashic Books, 2001), 169-76. Felix Moumié, leader of the Union des Populations Camerounaises in Cameroon, was killed in Zurich in 1960. Shafrudin Khan served as Frelimo representative at the United Nations from 1968 until the independence of Mozambique in 1975. He was an active representative of the movement who won friends and supporters both in New York and around the United States. After independence, he served in the Mozambican Foreign Ministry until his death in 1992. Peter Weiss, a lawyer associated with many progressive causes and a leader of the Center for Constitutional Rights, and Cora Rubin Weiss, president of the Samuel Rubin Foundation and a leading international peace activist, were financial supporters of the American Committee on Africa from its inception in the 1950s. Along with Carol Ferry and her first husband (see note 2), they were also friends of Eduardo Mondlane from his period in New York working at the United Nations. Boubaker Adjali was an Algerian photographer and journalist based in New York. Frelimo leader Joaquim Chissano served as foreign minister of Mozambique from independence in 1975 until he became president after the death of Samora Machel in 1986. He was reelected to the final five-year term for that post in December 1999. The Rev. Gayraud Wilmore is an African American theologian and a leader in the Presbyterian Church (USA). His books include Black Religion and Black Radicalism (Garden City, NY: Doubleday, 1972). The Southern Africa Committee was founded in 1965 as a committee of the National Student Christian Federation but soon became an independent group of New York-based activists. It published Southern Africa magazine, which began as a news summary on Rhodesia in 1965, became a monthly publication in December 1967, and ceased publication in 1983. The Angola Comité, in Amsterdam, was founded in 1961 with a focus on Angola and became one of the leading groups in the Netherlands supporting African liberation. In 1974 the name was changed to the Southern Africa Committee (Komitee Zuidelijk Afrika), and the group later merged into NIZA (Nederlands Instituut voor Zuidelijk Afrika). One of the founders and long-time leaders of the organization was Sietse Bosgra. José Ramos Horta, one of the top leaders in exile of the East Timor independence movement FRETILIN, won the Nobel Peace Prize in 1996 and has been foreign minister since the country's independence in 2002. The government of Mozambique provided consistent support for FRETILIN during the years the former Portuguese colony was occupied by Indonesia. Armando Guebuza, then national political commissar for FRELIMO, served in a variety of high cabinet and party posts after independence. He was elected president of Mozambique in 2003 and took office in 2005. Valeriano Ferrao, Mozambican ambassador to the United States from 1983 to 1991, previously served as secretary-general in the Ministry of Foreign Affairs. José Carlos Lobo, Mozambican ambassador to the United Nations from 1975 to 1983, was among those killed with President Samora Machel in a suspicious plane crash in 1986. Janet Mondlane is the widow of Eduardo Mondlane. Before the independence of Mozambique she directed the Mozambique Institute in Dar es Salaam. Her positions after independence included serving as director of the Mozambican Red Cross. Bonifácio Gruveta commanded Frelimo's guerrilla front in Zambézia during the war for independence. He was a member of the Frelimo central committee and political bureau until 1997.